Steel Sheds - Who Has The Best Steel Sheds? Steel sheds may lack the traditional appeal of wooden garden buildings, and yet they bring many benefits over them. For a start, they are very low maintenance, and of course there’s no need to worry about woodworm or wet rot. We’ve also seen metal sheds that are very attractive in their own right, and without the need for painting they can add a splash of colour to the garden environment. With so many models to choose from, finding the right one for you can seem daunting; that’s why WhatShed have created this handy guide to the 20 best steel sheds that can be bought online in the UK today. The first criteria that we set down for our league table is that all of the steel sheds in it had to have a base area of less than ten feet by ten feet, to differentiate them from metal workshops and garages. We then considered a number of factors including price and overall value of money, along with durability, looks, and design features. We were then able to compile the WhatShed guide to the top 20 steel sheds that can be bought online in the UK right now. With so many steel sheds available to buy online, in many sizes, colours and prices, selecting the overall winner was very difficult, so it’s very well done to the Yardmaster Shiplap shed. It not only looks good, it’s durable and very reasonably priced as well. Whether you want steel sheds that are maintenance free or timber sheds in a classical style, WhatShed will continue to bring you the in depth and independent reviews that answer your questions and help you make a perfect buying choice. This is one of the largest steel sheds to earn a place in our league table, and yet it’s still available at a very reasonable price of less than four hundred pounds. When combined with its attractive colour scheme and long warranty period, this is enough to carry it to the number one position in our top twenty. 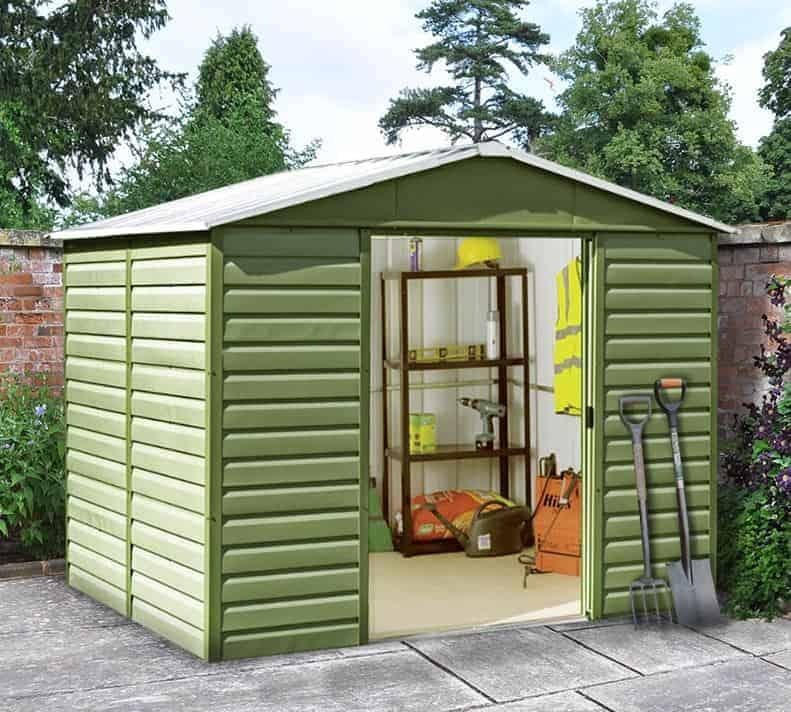 The first thing that caught our eye was the pale green colour scheme, which is much lighter and natural looking than we find on many of the green metal sheds we review. It should blend nicely into a garden background, and will therefore be a good choice for people who want the advantages of having a steel shed but don’t want anything that looks too metallic in their garden. With a base width of 2.85m and a base depth of 2.26m there’s lots of room to store items of any size inside, and due to the non-flammable nature of the steel we can easily imagine it being used for the storage of motorcycles or ride on lawnmowers. It’s also one of the tallest steel sheds we’ve reviewed, with the apex roof giving a peak height of 2.24m and an eaves height of 1.83m, or six foot. With a 12 year cladding guarantee supplied by Yardmaster as well, this is a durable and good looking steel shed that deserves to be on top of the pile. Long gone are the days when steel sheds were primarily available only in variations of silver or grey. From the attractive green colouring of our number one shed, we now move to a brown coloured shed that takes its cue stylistically from traditional timber buildings. It even has a woodgrain finish, which we thought added an elegant touch that helps to lift this large shed above the majority of its competitors. 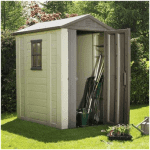 Once again we feel that this represents very good value for money for a shed that offers a base area of 3.13 x 2.42m, although it is more expensive than the Yardmaster shed we just looked at which in part explains their relative placings. We were particularly pleased to find that it comes with a 15 year warranty against rust, as this is longer than that on most of the steel sheds we review and shows just how tough, durable and weather resistant the galvanised steel cladding used by the American manufacturer Arrow is. This weather resistance is helped by the apex roof which quickly carries rainwater away, and this also creates lots of headroom. If you’re looking for a metal shed that has an undoubted aesthetic appeal, lots of space for storage, and is very durable as well, then this is one to add to your shortlist. From two of the larger steel sheds in our league table, we now come to the smallest, but it still has more than enough positive points to gain a place within the top three, not least of all a highly affordable price tag. It’s made by Absco, an Australian manufacturer who are beginning to make a big splash over here. Their sheds are very easy to assemble, and they’re also renowned for being supremely tough and stable; in fact they’ve been tested to withstand storm force winds of around 95 miles per hour, which we think makes them perfect for the ever unpredictable British weather. This is the first pent roofed building to make it into the top 20 steel sheds, but this still sweeps rainwater away and helps create this shed’s compact profile. It has a width of 1.53m, a depth of 0.78m, and a height of 1.92m, but that’s still more than enough to hold a good supply of gardening goods, and the taller than average doorway height of 1.78m makes it very easy to carry objects in and out. We feel that this would be a great choice for a small garden where available space is limited, and it’s also backed with a very long, and very reassuring, 20 year guarantee. This is the fourth colour scheme in as many sheds, which shows what a diverse category steel sheds is. The paintwork on this shed caught our eye more than any other, and whilst it may not be a traditional colour for a garden building, we found it very attractive and so it should prove popular with those who have very colourful or contemporary gardens. The mountain blue paintwork, which contrasts nicely with the cream detailing, also adds an extra protective layer against the elements in combination with the zinc coating that comes from the galvanised steel production process. This then is a very tough and durable garden shed, and the 0.3mm thickness of the cladding means that it feels very stable and reliable once assembled. We were pleased to see that these first impressions were backed up by a 20 year manufacturer’s guarantee, which is longer than we usually see provided with mid sized steel sheds such as this. It’s not the tallest shed, with a ridge height of 1.93m, but the base dimensions of 1.70 x 1.44m are more than enough for a lawn mower and a selection of tools and equipment. 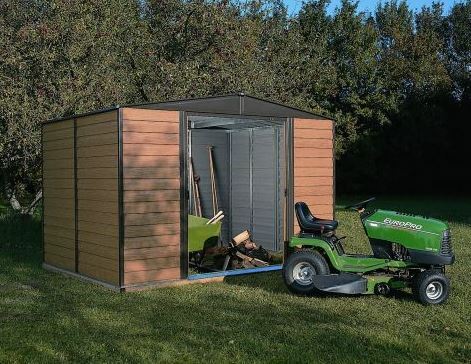 If you’re looking for a tough, maintenance free shed that has a unique look all of its very own, then this could be an ideal purchase at a price that’s hard to beat. Pent roofed steel sheds may not be as prevalent as their apex roofed counterparts, but we feel they bring significant advantages of their own. Not only do they have a classic look that many people love, they are also less ostentatious than apex roofed sheds, and can often be hidden away behind a shed or wall, thus increasing their overall security. It’s also worth pointing out that, like the majority of the steel sheds we review, there are no windows; this itself can help to boost security as it means that there is no way of passers by knowing whether anything of value is being stored inside. One other advantage that a pent shed brings is that they are typically less expensive than an apex shed. This is shown perfectly with this BillyOh model, which is the second cheapest of all the steel sheds in our league table, and yet still provides a useful six foot by four foot storage area. We also liked the all green cladding, which is only broken by the inclusion of two ventilation panels on the front gable; even more pleasing is the fact that it’s covered by a 15 year guarantee, which isn’t something that we’d expect to see on a shed that’s as affordable as this one. This is the second from the Absco range of steel sheds to earn a place within our WhatShed league table. This model is much larger however, with a base size of 2.26 x 3.00m and a height at the top of the apex roof of 2.06m. The increased size here means that the quick assembly system becomes even more useful. Absco use an exclusive system known as Snaptite; this means that the pre-fabricated panels simply snap into place along a frame. It makes the installation much simpler and quicker than you might imagine, and we feel that it’s a real value adding, and time saving, feature. We know that some people aren’t too keen on silver colour schemes for their garden sheds, referred to by Absco as ‘zincallume’, but we feel it helps to give the shed a tough, no-nonsense appearance that in itself could act as a deterrent to opportune thieves who are in search of an easy target. We were particularly pleased to see that the shed came with a 20 year guarantee against perforations resulting from rot, making it one of the most durable and reliable steel sheds that we’ve reviewed, and adding even more value to a price point of just over three hundred and fifty pounds. We’ve reviewed lots of Yardmaster’s steel sheds, and we inevitably find that they are very well fabricated and use high quality components. This 84PZ model is a perfect example of how they typically offer excellent value for money as well, which is why it climbs into the top half of our WhatShed league table. 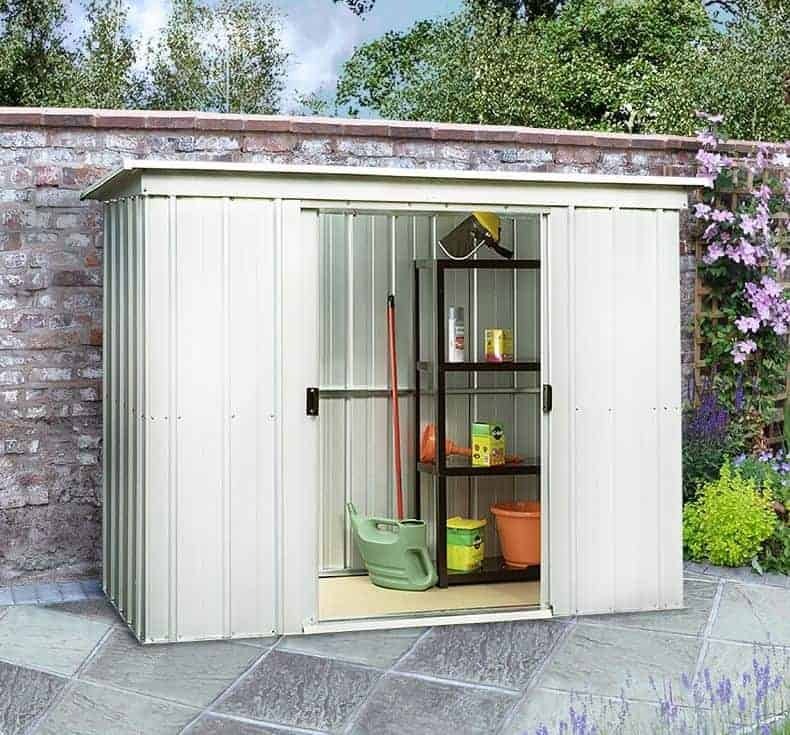 There are many people who would love the benefits of an eight foot by four foot storage space in their garden, particularly one that didn’t take up extra time and money because of retreatments, but don’t feel that they can afford. For a price of well under two hundred pounds, however, this shed is available to all. It’s not one of the most attractive steel sheds we’ve reviewed, but it gains our plaudits for its value and functionality rather than its form. A base kit is included as standard to make it easy to attach to a level area of concrete or patio, which isn’t something that we always see provided with the metal sheds we review. We also liked the sliding double doors, which are seated internally to give them added protection against knocks as well as the elements. Guaranteed against rust for a 10 year period, this is a low cost shed that should prove to be trouble free once installed. From a distance this has the look of a classic timber garden shed thanks to its golden brown shiplap style cladding, and darker brown detailing around the wide opening double doors and apex roof. We were pleased to see that it looked just as attractive upon closer inspection, with an eye catching wood grain effect being applied across the cladding. Of course, being manufactured from strong galvanised steel, it will never need to be painted or treated with a preservative, which is one of the reasons that so many people are turning to good looking steel sheds such as this one. We were pleased to see that a 15 year warranty has been applied by the manufacturer, which is longer than many that we see provided with steel sheds and as long as any that we see on a similar sized timber shed. Such a long warranty period can be given because the galvanised steel used is very tough, and backed up by strong frame to provide excellent stability in windy conditions. The apex roof also plays an important role in keeping bad weather at bay by sliding rainwater away rather than allowing it to sit on the surface, so you can be confident that whatever you store inside will be kept safe and dry. Whilst most of the steel sheds we’ve reviewed offer exceptional value for money, there’s still room in the upper half of our top 20 league table for a model that may prove to be beyond the budget of some people. 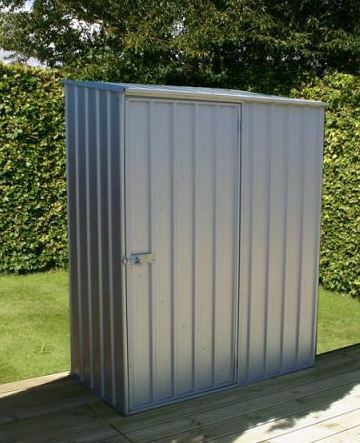 Whilst its price of over one and a half thousand pounds has been taken into consideration when determining its final position, it is one of the most eye catching metal sheds we’ve seen, and comes with a host of high end features that we don’t often find elsewhere. If this Trimetals shed falls within your budget, therefore, then you may want to put it at the very top of your own individual list. The first thing we noticed was the light green colouring unlike anything we’ve seen on metals sheds from other manufacturers. That’s because whilst the shed itself is made from strong galvanised steel, it’s then been coated in PVC and powder coated. This means that it’s resistant to rust as well as rot, and we were pleased to see this resilience backed up by a 25 year guarantee, which is longer than that given on any of the other steel sheds we’ve reviewed. We also liked the two windows to the sides of the double doors, and the key operated lock which is supplied as standard, and which makes this a very secure and versatile garden building. 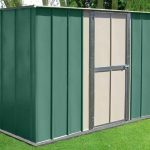 Green coloured steel sheds are very much a favourite with us, and we know with many consumers as well, as they mix very well with a typical garden background. 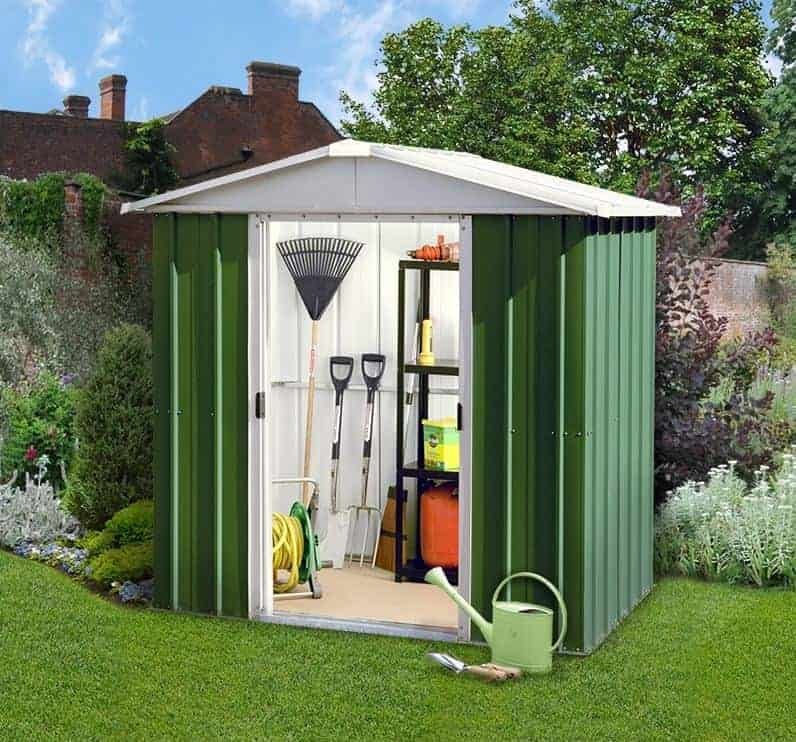 This completely green model is unobtrusive and yet highly functional, as its base area of 1.94 x 2.12m makes it ideal for the storage of garden goods and equipment, or it could even be used as a place to relax and carry out a hobby with the installation of an artificial light source inside. There are no windows, which is a security aiding feature that we’ve come to expect with mid sized steel sheds, but the interior still feels refreshingly airy, even on a hot day, thanks to the two vents on the gable. 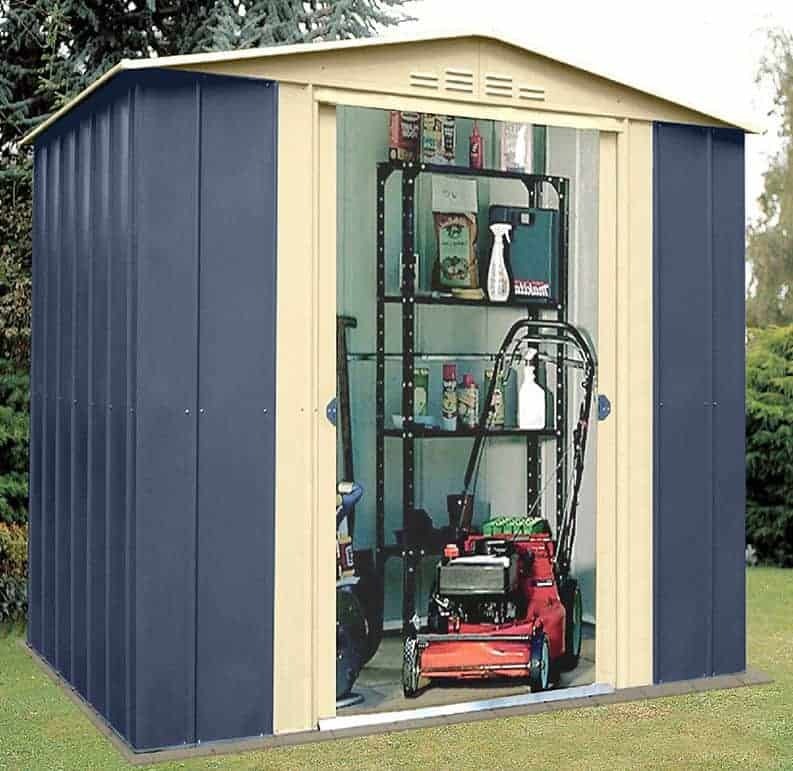 This is not only good for the shed owner, but for stored goods as well, as it helps to prevent the build up of condensation that metal sheds can otherwise be prone to. What carries this particular building into our top ten, however, is its very low price. We wouldn’t necessarily expect to see a six by seven shed available for not much more than two hundred pounds, especially when you consider that it comes with a free anchor kit to aid installation, as well as a 10 year warranty against perforations resulting from rust. 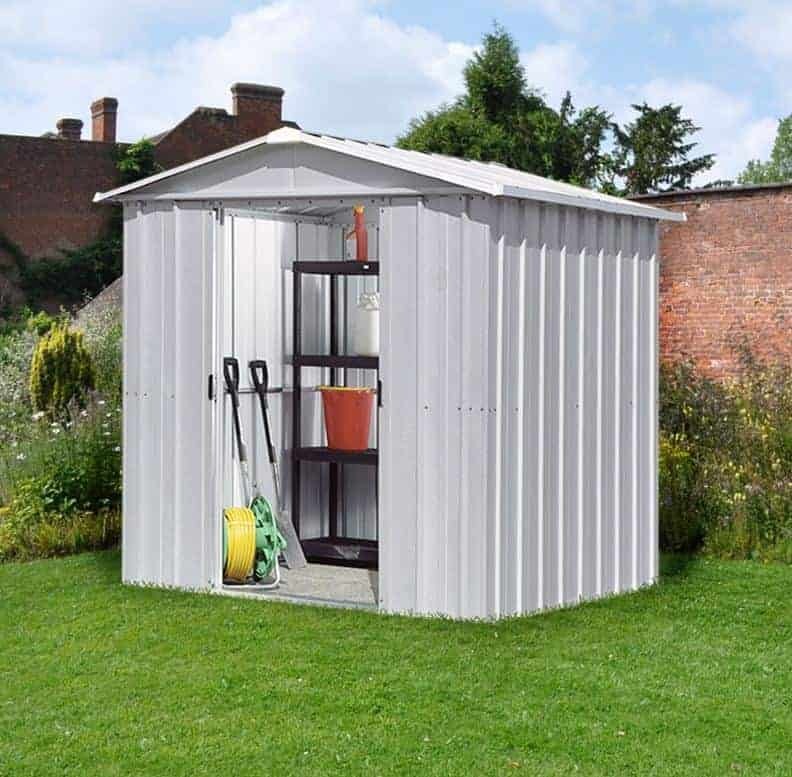 This is a compact, silver coloured pent roofed shed, and in those respects it resembles many of the budget priced steel sheds that we’ve reviewed. 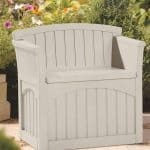 We were pleased to find, however, that just because it has a low price doesn’t mean that any corners have been cut by the manufacturer. 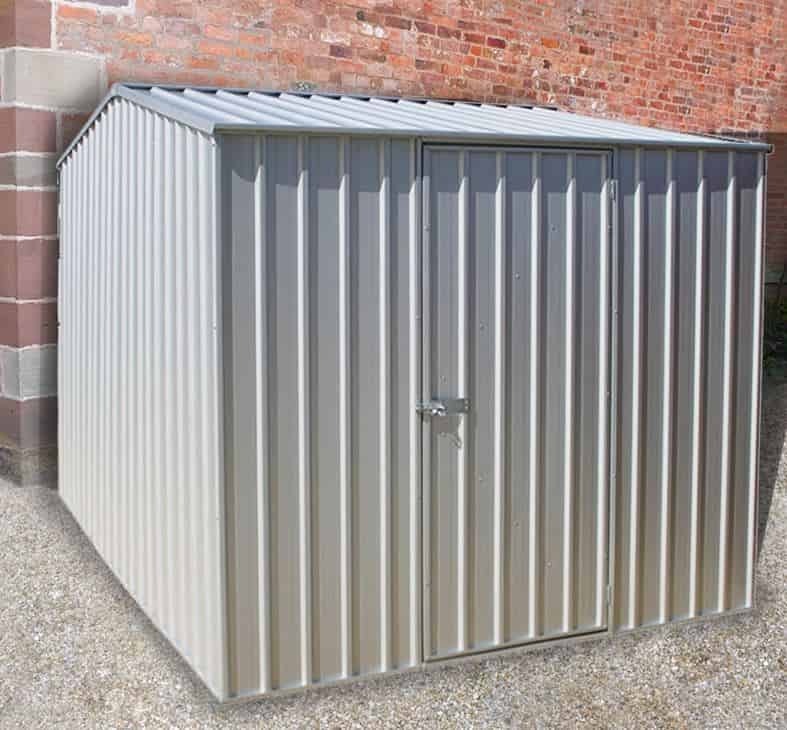 This is by far the cheapest of all the sheds that feature within our top twenty league table, and yet it still features tough galvanised steel cladding with a zinc finish and a 10 year manufacturer’s warranty. For this reason, it more than deserves its place among the very best steel sheds that can be bought online in the UK today. The pent roof has a peak height of 1.74m, which is lower than most of the steel sheds we see, but the inclusion of sliding double doors means that even taller items such as rakes and hoes can be manoeuvred inside. We were also pleased to see that the door handles were holed and ready to accept a padlock, which although not included as standard needn’t be an expensive additional purchase. 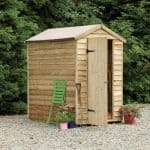 If you’re looking for a compact and yet reliable shed that can be bought for not much more than a hundred pounds, then we feel that this is certainly an example worthy of consideration. Unlike the other Absco sheds in our top 20 league table that come in a stark, and yet not unattractive, zinc colour, this has been given a neatly applied eucalyptus colour scheme. It also has a pent roof that although it has an accommodating peak height of 2.06m doesn’t rise too obviously up in the air. The combination of these two factors means that it can hide away in a garden background and can therefore be a tough and secure lock up for your more expensive gardening equipment, especially with the addition of a padlock or alarm system. Once again we were pleased to find the Snaptite assembly system in evidence again, which is simple to use even for those who’ve never attempted to assemble a sizeable garden building before. We were equally happy to see the 20 year warranty provided by the manufacturer again, although so thick and tough is the steel cladding used on this shed that we wouldn’t be surprised to see it far outlasting even this generous guarantee. Steel sheds don’t come much tougher, or much more resilient, than this, and so we feel it would be an ideal purchase for those whose gardens are in exposed areas that are often subject to heavy winds and storms. 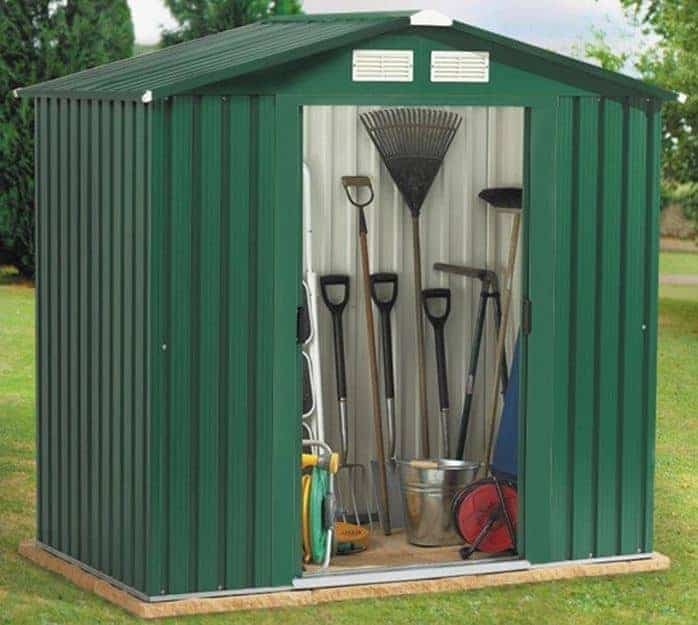 Eight foot by six foot steel sheds such as this one can be an ideal storage facility for the small or medium garden. Whilst the base dimensions of 2.02 x 2.37m are more than enough to take a lawn mower or two as well as a large selection of gardening implements it won’t take up too much of the precious lawn space. Be aware, though, that this isn’t the tallest steel shed that we’ve reviewed, so be prepared to duck down when entering through the double doors which have an opening height of 1.57m and an opening width of 0.79m. One thing that we were glad to see was the inclusion of an anchor kit, which makes it easy to screw the frame down to a flat concrete base. This isn’t always something that we see on steel sheds that are as inexpensive as this one, and it means that the price you see is all that you’ll have to pay. 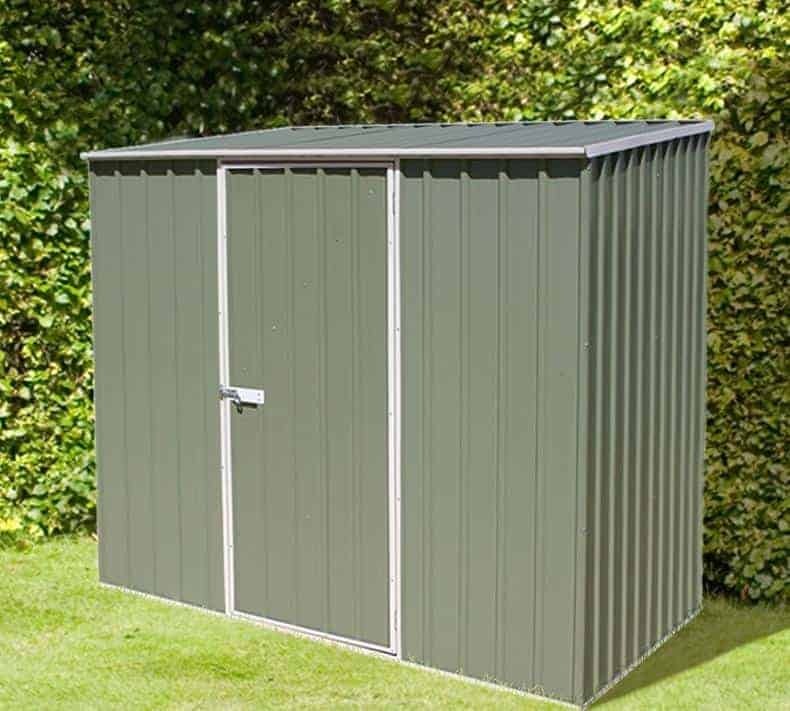 Considering the size of the building, this has to be one of the best value steel sheds that we’ve reviewed, and so if you want a low cost shed that doesn’t charge extra for bells and whistles that you don’t really need, then this could be an ideal purchase. 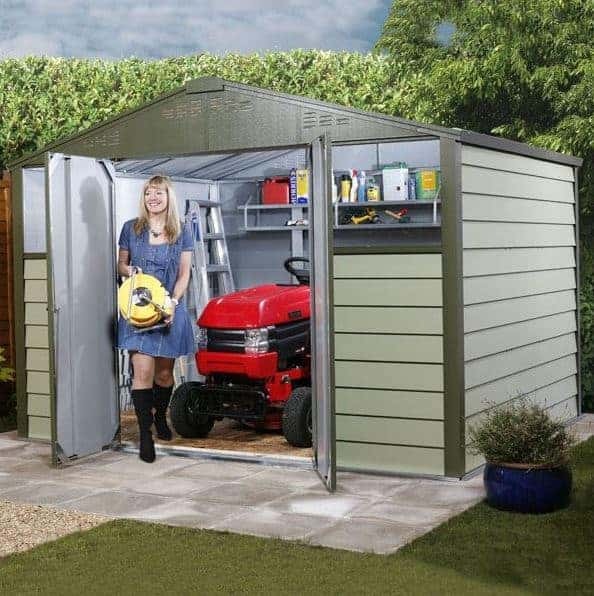 This is the second BillyOh model to feature in our list of the 20 best steel sheds that can be bought on the internet today, and whilst it is slightly larger it also has a larger price tag which accounts for its lower overall placing. 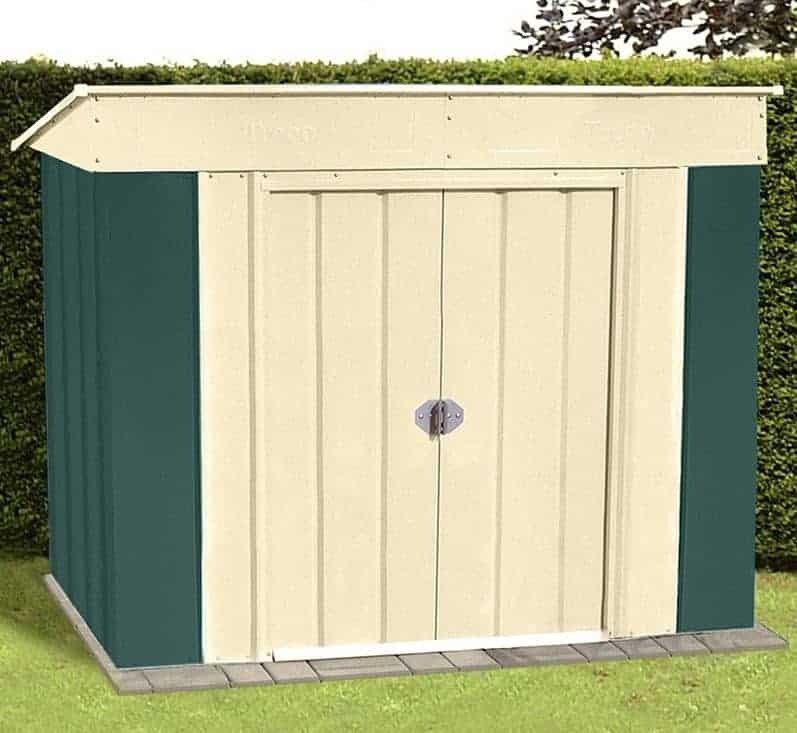 We still feel that it represents good value for money at less than two hundred pounds, however, and it’s also a very good looking shed thanks to the dark green colour scheme with the two white vents at the front standing out in a pleasing contrast. There’s one additional feature here that we found very welcome, a strong exit and entry ramp. 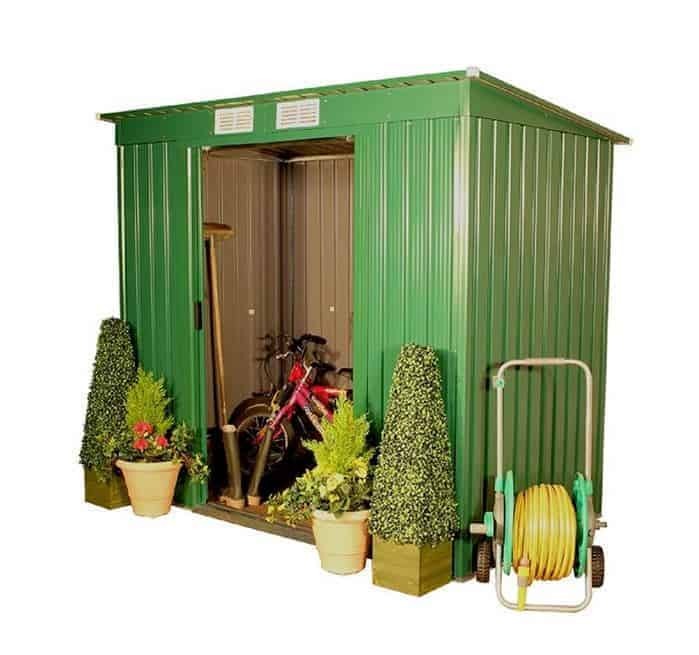 It’s not something that we often see on steel sheds, especially not ones at this price, and yet it allows the owner to use a wheelbarrow or trolley to load and unload heavy and bulky items from the shed. For that reason, we feel that this would make a good low-cost purchase for people who do a lot of gardening, and are therefore likely to have stockpiles of soil, compost and aggregate, or those who have difficulty lifting or carrying heavy items on their own. There’s also the reassurance of a 15 year no rust guarantee, which is another value adding feature that we liked. The vast majority of steel sheds that we review come without a floor of their own, and are designed to be fixed directly onto a pre-exisiting and level area of concrete, or alternatively onto a section of patio or paving. This can lead to a cold interior during winter months however, and it can also result in the problem of dusting where fine particles of concrete can form a coating on items. That’s why we were pleased to see that this eight by four foot shed from Yardmaster comes with a floor support kit as standard. This means that a wooden floor can easily be laid upon it, to create a warmer and more traditional base. Because this wooden floor will be elevated above the ground, it’s also protected against the threat of ground moisture. Whilst the floor itself isn’t included, this can be bough inexpensively and decking boards can make an ideal substrate for this purpose. Even with this additional purchase, we still feel that this represents very good value for a well constructed silver coloured pent shed. We would have liked to have seen a longer warranty period than 10 years however, and that would have lifted this much higher up our list of the best steel sheds that can be bought in the UK today. BillyOh produce a number of steel sheds, all with their own unique looks but thankfully all delivering high quality at a great price. We weren’t surprised then to find that we liked this compact metal shed at first sight, and the thing that gives it a unique appearance amongst this range is the white apex roof above the all green cladding of the body of the shed itself. This means that it’s not as natural looking as some green coloured metal sheds, but it does have striking looks that we think will find favour with people who like to make bright and bolt statements with their garden buildings and accessories. The apex roof does a very good job at carrying rainwater away, and the tough galvanised steel cladding also ensures that precipitation is kept out. It is rather lower than many other apex roofs that we see on similarly dimensioned steel sheds, with a peak height of 1.77m and an eaves height of 1.43m. This has had an effect upon the final positioning of this good looking and strong shed in our league table, but on a positive note we were impressed by the 15 year guarantee and once again the inclusion of a full width entrance and exit ramp. Pent sheds, by their very nature, are typically lower in height than apex sheds of the same base size. Whilst this means that the interiors may not feel as comfortable and welcoming, and that you may have to bend down when going through the doorway, they can bring advantages of their very own. 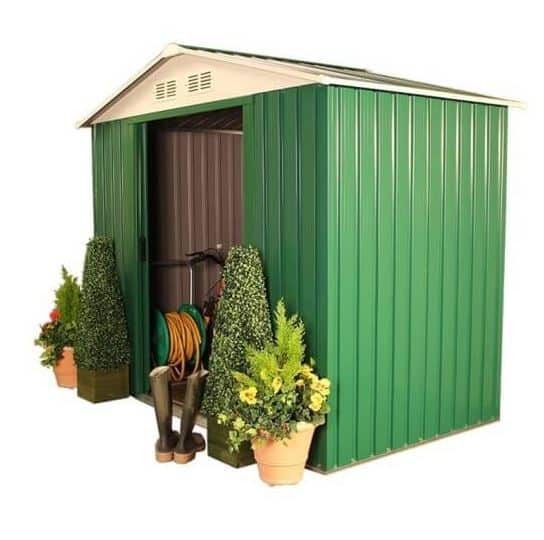 This Grandale shed perfectly illustrates this; it has a ridge height of just 1.42m and an eaves height of 1.22m. 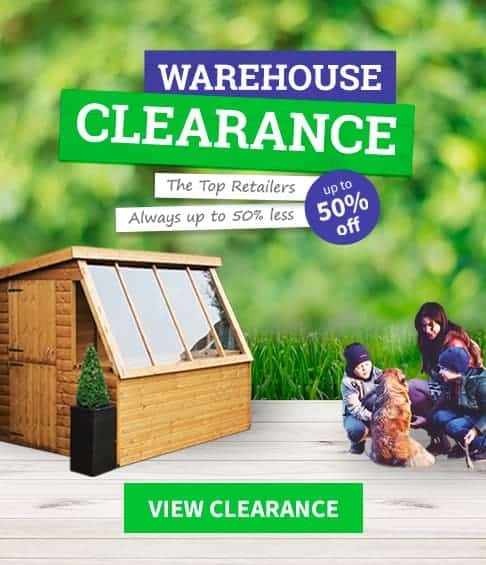 This makes it significantly shorter than even the BillyOh Ashington shed which comes before it in this league table, and yet it can still store a large numer of shorter items and would be ideal for items such as lawn mowers or bicycles. Being so short it can easily be secreted behind a fence or partition, making it potentially one of the most secure steel sheds we’ve seen. Despite, or possibly because of, its unobtrusive nature we also find it very charming, and its good looks are enhanced by the cream colour scheme applied to the double sliding doors and pitched roof. We were pleased to see that it had been galvanised and painted inside and out, and that the toughness and reliability this brings is reflected in a 20 year manufacturer’s guarantee. 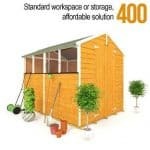 If you want a high quality shed, but height itself isn’t an issue, then this could be an astute buy. 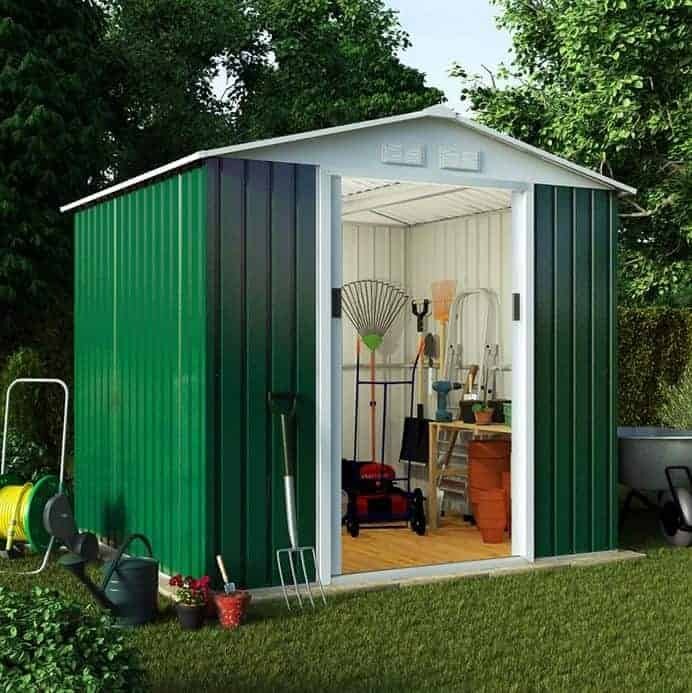 Green and white is a classic combination when it comes to steel sheds, and this model looks good inside and out, as it has flawless white paintwork throughout the interior as well as a green and white exterior. We were glad to find this, as not only does it make this one of the more attractive metal sheds that we’ve reviewed it also adds an extra layer of protection against the elements outside and against condensation and knocks inside. We were also impressed by the galvanised steel cladding itself which is slightly thicker than most that we see; this also means that the manufacturer has been able to offer a 12 year warranty against rust perforations rather than the ten year warranties that we often see on mid sized steel sheds from Yardmaster. 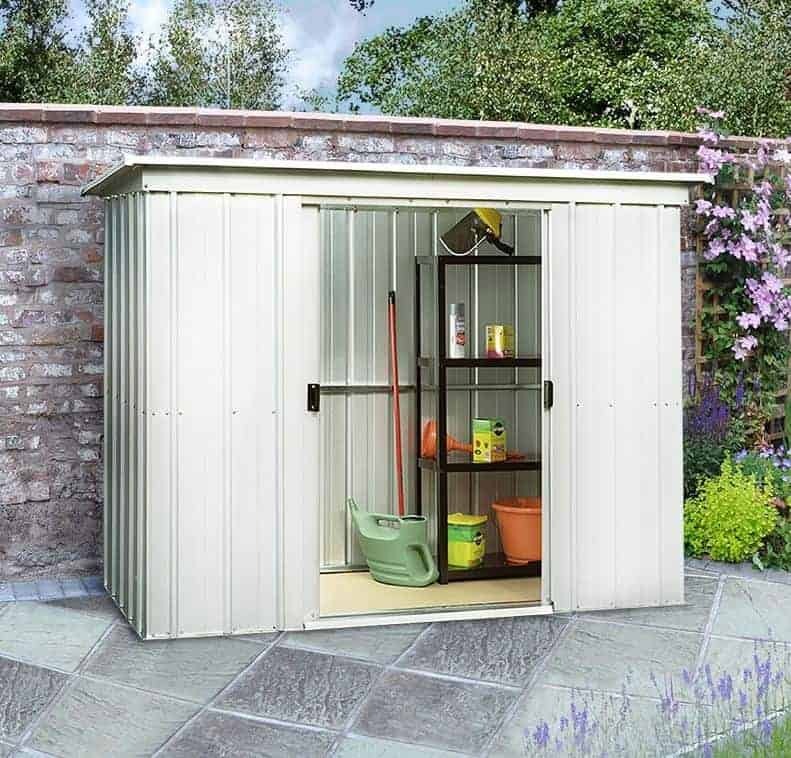 The dimensions of this shed are 2.02 x 2.17m, and the wide opening sliding double doors make it easy to store and retrieve even wide and tall items. 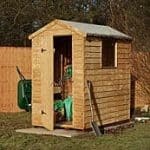 For a shed of this size we also feel it represents very good value for money at price of not much more than two hundred pounds, which is another reason that it earns its place within our WhatShed top twenty league table. We’ve reviewed lots of steel sheds that are silver, grey or green, and many that are various shades of brown as well. While we found many of them to be aesthetically pleasing in their own right, we always like to see sheds with their own unique styling and colour schemes as that gives the customer even more choice and the opportunity to buy a shed that’s perfect for them. That’s one reason why we were pleased to see this mid sized apex shed from Store More. It comes in an anthracite colour scheme that we’ve not seen used by any other manufacturer; we found it very pleasing on the eye, and it should be a perfect match for gardens that have lots of stone or rock features or buildings and accessories that are painted in a dark colour. 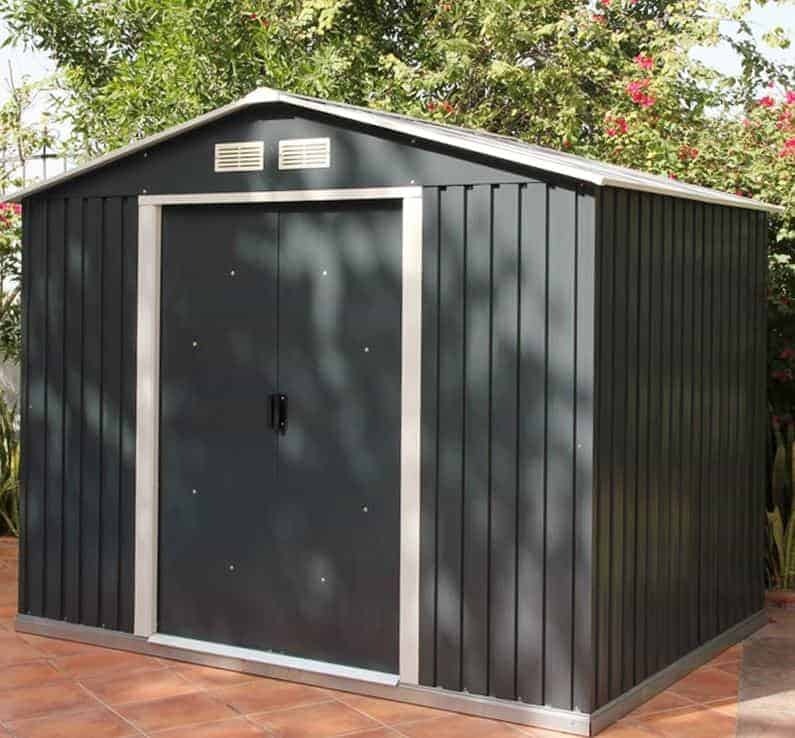 It’s not only its good looks that earned this model a place within our league table of the 20 best steel sheds that can be found online today, as we also found it to be a strong and tough shed once assembled. With galvanised steel cladding used throughout, and an apex roof to channel rain away, this should also prove to be very durable. It does however only come with a 10 year warranty which we would have liked to see extended further, and this combined with its higher than average price prevents it from being ranked higher. The final spot in our guide to the UK’s twenty best steel sheds that can currently be bought online goes to another from the BillyOh range, and once again it’s the exceptional value for money that really caught our eye and that gives it an advantage over many of its competitors. 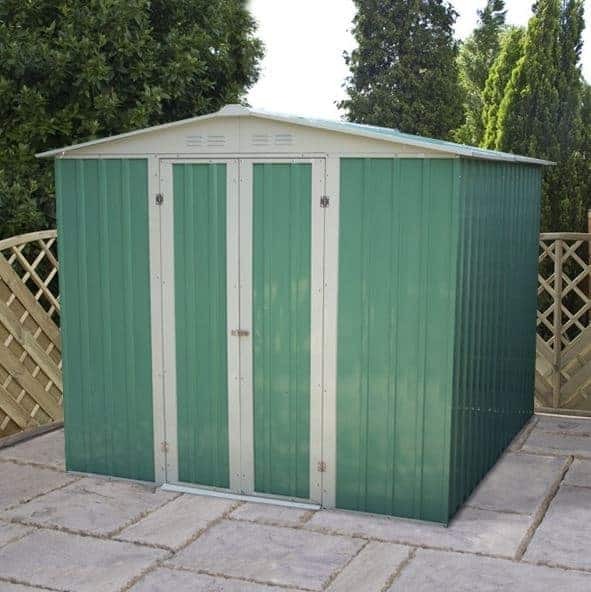 In a green and white colour scheme that we always find pleasing on the eye, it means that the many benefits of a good looking four foot by seven foot steel shed can be enjoyed for less than a hundred and fifty pounds. This represents a great saving when compared to similarly sized wooden sheds, and that’s before taking into consideration the time and costs involved in the retreatments that they often need. One feature that we particularly welcomed here, and which isn’t always included in low priced steel sheds, is a foundation kit. This means that people who don’t already have an existing flat concrete base to site their shed on can easily create one of the perfect size. It’s only the 10 year warranty period and slightly thinner than usual steel cladding, 0.25mm in this case, that consigns what is for its size an excellent budget shed to twentieth position in our list. Hi Wendy, it depends on the quality. Some of the Asgard steel sheds are very well ventilated and do not leek. If you get a cheeper one then you are a lot more likely to have problems.